Pesky surface ridge and passing storms. “When do we get rid of the North Wind in the Bay area? I have received a good number of e-mails like this the last week or so. If you kite or sail in the East Bay or Sherman Island you know exactly what C. is talking about. And if your home venue is at even normally reliable sites like Waddell and 3rd. you have experienced a number of weird days recently. 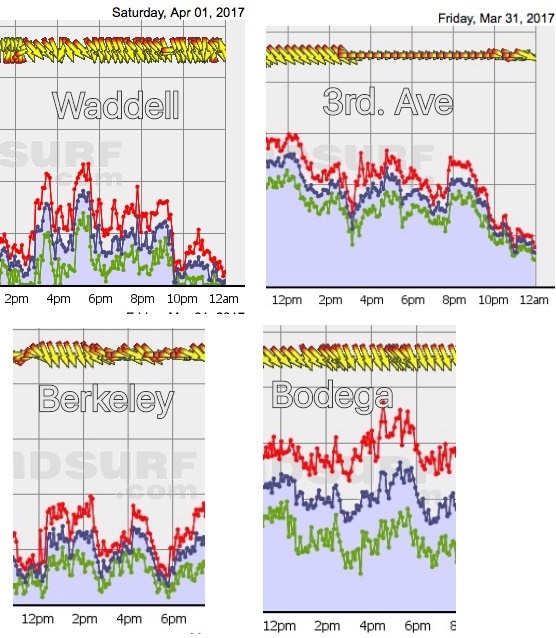 For example take a look at the Waddell wind graph for Waddell. Notice the unusual UP AND DOWN winds. Or the strange 3rd. Ave. graph with the winds much stronger in the morning than in the afternoon. Or the Berkeley graph with strange wind shifts and up and down velocities. And even normally trust worthy Bodega with over 20 knots difference between the lulls and the just. And the Sherman Island wind graph is so pathetic that I won’t bother putting a graph with endless weak northerly winds. So what is going on with our wind. March is always fickle wind wise. Some years the North Pacific High’s surface NW winds are roaring along the coast after the passage of each storm and sails and kites are stretched by powerful wind. Other years the North Pacific High’s surface NW winds are largely absent and there are few windy coast and Peninsula days. But this year we have had almost endless strong winds from the North Pacific High but the quality of the wind on the coast and inside the Bay has often been poor. At a quick look the model projection to the left looks very promising. The Red areas in the map represent low to mid 20’s wind. So it looks like Waddell, Coyote and 3rd. Ave. should rip. But look at the area off the coast inside the left white diamond. Notice the weird waves of powerful wind interspersed with mild winds. Now look at the white diamond inside the Bay Area. Because of turbulence induced by topography the waves are not as clear but you can see strong and light wind areas intermingled. You can easily image how you would experience these wind pattens on the water. But the question arises… what is causing all this up and down action? The next image gives you a clue. First find the huge dome of high pressure air known as the North Pacific High. Note the clockwise wind flow spiraling out from this surface high pressure. Note how the NPH is sending NW wind to Southern California but the wind near the Bay Area is more NNW. This is an issue since wind has to curve in the Bay Area to bring winds to sites inside the Bay Area. And clearly is NW makes the curve easier than NNW wind. Now look carefully at the wind flow just to the north of the Bay Area. Notice how it is N. to NNE flow. as wind comes down the Central Valley. Now picture NNW ocean wind trying to curve into the Bay Area and the effect of NNE wind on this curving. You can easily visualize that this NNE winds will tend to divert or weaken the westerly wind moving into the Bay. Most of the time the NNE surface flow fades away mid day so it does impact our sailing wind. But why NNE flow coming down the Central Valley? Look again at the NPH. Notice how this mountain of high pressure air has pushed an extension or ridge over far Northern California. Notice how results in N. coast wind in that area. And as the ridge extends over the land the wind flow is disrupted and weakened over the coast range but becomes NE wind in the Central Valley then heads towards the Bay Area. So NNW to NE flow occurs when the North Pacific High form a ridge. Look carefully and you can see that this ridge shape has also caused the winds at the Bay Area ocean buoys to be more NNW rather than the more typical and favorable NW. But there is another factor that has been messing with our winds. Even if the NNW to NNE surface winds coming from the Central Valley fades mid day there are still strong NNW to NNE winds just aloft that often continue all day. In this next image note the elevation above the surface scale on the right side of the image. Note the strong NW surface winds at 3-4PM west of the Bay Area and how those winds curve into the Bay as WNW to W wind. Now watch as we jump in elevation from the surface to 975 mb level which averages about 1000 feet in elevation. Notice how the winds inside the Bay are still WNW to W.
Now watch as we jump to the 925 mb level which is at about 2500 feet in elevation. Wow! At that level we still have NNE winds. 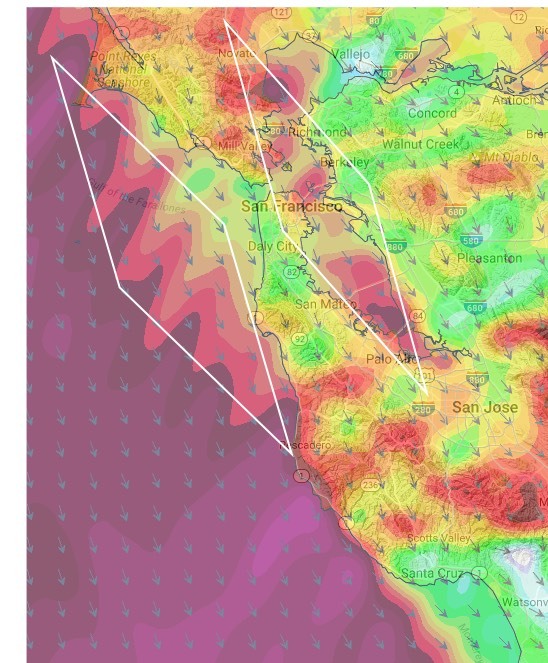 And as those wind interact with the North Bay and East Bay coast range they become turbulent and randomly impact the strength and direction of the surface winds hitting your kite or sail. This accounts for the huge gusts and lulls you saw in the wind graphs below and in the model output in the second image. That is enough for one blog but… we are still left with one question? What causes the North Pacific High to develop this ridge that in turn creates the NNW to NE surface wind and wind aloft. So stay tuned for the 2nd part of this blog. Mike.